Adults of any age can use this video as a guided exercise/fall prevention program. Adults of any age can use this video as a guided exercise/fall prevention program. This is an instructional video, packed with information useful for older adults regardless of age or skill level. 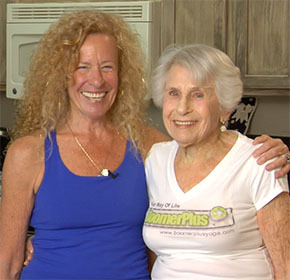 It's an excellent example of an energetic senior applying the BoomerPlus® principles of "Wellness by Design" by taking an active role in maintaining her strength, flexibility and vitality with a regular therapeutic yoga practice done safely in her own home. Educators may use this video as a teaching tool and it's a great gift for anyone interested in a gentle exercise program. Includes program notes by Amy Kraft.